You are here: Home / Featured / CEBU PACIFIC AIR: FLY TO MALDIVES, ATHENS and BERLIN FOR AS LOW AS 6240 ALL-IN! 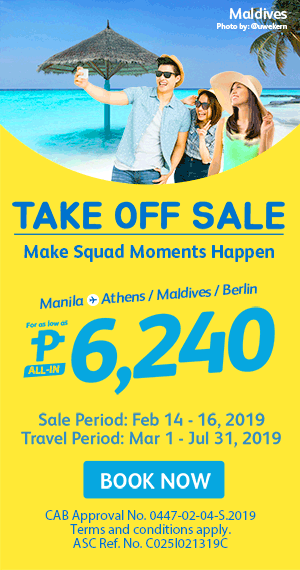 CEBU PACIFIC AIR: FLY TO MALDIVES, ATHENS and BERLIN FOR AS LOW AS 6240 ALL-IN! Have you been dreaming to visit Maldives where sands are as white as the smiles of the locals? Or Athens, the historical capital of Europe? Or Berlin, known for its historical associations as the German capital, lively nightlife, its many cafés, street art, clubs, bars? Worry no more! Cebu Pacific Air will definitely bring you there for as low as 6240 ALL-IN FARE departing from Cebu, Manila, Iloilo, Clark and Davao! This is a perfect getaway this summer with your family and friends.